I just wanted to thank you for a lovely weekend at Missenden Abbey. We thoroughly enjoyed the course, and Abbie was brilliant. We are already looking to book again later in the year with friends. In a world were people are quick to complain, we wanted to say thank you for a great day. Really enjoyed last night's wine tasting - Erik (our host) was very knowledgeable and entertaining. Many thanks for a wonderful day at Brasserie Blanc on Saturday. Every bit enjoyable. Also, I've discovered Chris's podcasts and am enjoying adding to my knowledge of wine! Again many thanks for a great day. What a great night we had at the wine tasting. Anne-Marie was lovely and knowledgeable. We really wanted you to know how much we enjoyed the wine course run by Abbie at Missenden yesterday. It was a really interesting event with a great group of people and very professionally delivered by Abbie whose knowledge and enthusiasm was impressive. We both learned quite a bit too! I wanted to drop you a quick note following our completion of the WSET Level 2 course. Marty has been an incredible tutor who is clearly so passionate about wine and ran 3 amazing sessions. Marty was engaging throughout and made everyone on the course feel comfortable no matter what their experience level in wine was. Hopefully a good result in the exam and look forward to doing more with the thirty fifty team in the future! I just wanted to say thank you to you and Chris for the wine tasting supper on Friday evening. My friends and I all thoroughly enjoyed it and learnt many interesting facts. It was a fantastic event. Just a quick note to say how much my wife & I enjoyed yesterday. Good wine, good food, lovely company & very informative. Please pass on our thanks to Diana. Finally a big thank you to you for being so understanding about our possible travel issues. I would just like to say thank you it was a great experience and I would definitely recommend this to everyone. I just wanted to email you regarding the Wine Tasting course my wife and I attended on Saturday at Le Monde in Cardiff. We both thoroughly enjoyed the day, this was the first event like this we have ever attended and were unsure what to expect. We found Rob knowledgeable, enthusiastic and friendly. He made the day fun and relaxing, we learnt a lot from him. Please pass on our thanks to Rob..
Also, the meal was lovely too..
We will certainly be attending another one in the future. I would just like to pass on some of the great feedback I have received from the team this morning following our wine tasting event hosted Helen last night. Everyone enjoyed the event and all said that Helen was great, very engaging and that she brought an element of fun to the session. Nice wines to try, interesting hints & tips, a lovely venue and I personally came away with a few experiments ( for want of a better word) to try on my friends when we are next out. A great evening and a few of us are now thinking of booking a champagne tasting evening next year. Please pass our thanks to Helen as she was a large part of making our evening enjoyable. Kate - Great evening and really informative. Helen was great! Thank you! John - Very enjoyable and informative - well presented! I just wanted to pass on how great the wine tasting class was yesterday evening at the Milestone. Rob was fabulous - really friendly, knowledgeable and fun. We learnt a lot and had a brilliant evening. I'd recommend it to anyone. Yes, thank you, we all really enjoyed the wine tasting and Martin was brilliant - he was relaxed and fit in well, and he made the evening both really fun and informative. We wish to provide feedback about the wine tasting event we attended at Piccolino, Liverpool on Tuesday 12th September 2017. The wine tasting event was undertaken by Erik. We learnt much about tasting wine and appreciating wine in a good way. We continue to use the knowledge gained and hope to enjoy good quality wine with relevant knowledge. Erik was friendly and demonstrated his knowledge about wine tasting to group. Miles - Well presented, great info, nice lady, learnt a lot. Andrea - Chocolate - 5, fabulous hostess! Kat - Very informative, very enjoyable, Helen was a very good host. Kate - Fantastic evening - learnt a great deal and really enjoyed the bubbles! John - Sparkling presentation. Informative and tasty, thanks! James - Very clear, very helpful, very good. Robert - Really interesting, not a massive fizz fan, but a really enjoyable evening. Cleo - A great evening. Very informative and well presented. Really interesting I will recommend to friends and family. This is a belated thank you for a wonderful day last month tasting various champagnes and sparkling wines. All of our party enjoyed ourselves greatly and we were impressed with the knowledge of our hostess (Camilla I think) and her easy, yet informative style of presentation. I would not hesitate to recommend this experience to my friends. Sophie - Very informative, great to learn the science behind the tasting and which wines work best for my palate. Helen was an excellent host. Emily - Very informative and enjoyable at the same time! Sue - Really good, really informative, host very good. Sally - Thank you, that was fun, learnt a lot! Just wanted to say we had a great night on Friday and Chris was informative and fun. My wife really enjoyed it especially as Rioja is her favourite wine. Will will book again and keep a look out for other events. Iaine - What a lovely day - thank you very much Helen - I enjoyed it tremendously and learnt a lot as well. We had a fantastic time Saturday on the wine course. Abbie was very knowledgeable , gentle - not patronising but also knew exactly how to work a room and deal with challenge. She was also great fun. I can't praise her - or the course and the wines - highly enough. I just wanted to say how impressed we were with Abbie, our wine expert at Great Missenden last Saturday. We had a great day, very informative and enjoyable and Abbie struck just the right balance between education and enjoyment! We would highly recommend this event to others. Really enjoyed the Champagne and sparkling wine tasting on Friday 10th Feb in London. Very informative and learnt quite a bit. Hope to try another tasting in near future. Masahiko Fabulous - Host was impeccable. Thank you. Helen = amazing. Sarah - Excellent! Lots of fun facts. Helen is very friendly and happy to answer questoins. Very good value for money. Tal - Helen was very interesting, friendly and informative. An all round good evening. Thank you! I am really pleased I passed the Level 2! I mentioned to Garry already that I really enjoyed the course. Gary was a great tutor and made the course informative and fun. Please thank him on my behalf again. Thanks also to the chef for the nut free meal it was perfect. Would just like to thank you for our excellent wine tasting experience day yesterday. It was so informative and we came away we more confidence than we had previously. Camilla is an asset to you. She is so knowledgeable and informative. We shall be looking into the discovery day in the near future. I attended the wine tasting course given on the 6th February in London. I enjoyed my day and found the course informative. Many thanks! I just wanted to drop you a quick line to say how much my husband and I enjoyed the session with Helen on Friday night. We had a really great evening. Helen was the perfect host, imparting just the right level of knowledge and expertise, plus a good helping of fun. Please thank her for us! Joanne Wade - A superb day, very informative and most importantly, entertaining! Thank you Helen. Ali McManus - Great fun, very informative, would definitely recommend, Helen was fab! I just wanted to say that I attended a wine day in London on Saturday 20.06.15 run by Helen and I thought the whole event was excellent, so please pass on my thanks. Great presentation and informative and very enjoyable. Good fun too. 10/10! I really enjoyed the Level 3 course delivered by Chris. I learnt loads and have been using the skills nearly every night!!!!! We've had an absolutely fantastic day, Erik. You put on a fun and informative day and you've made our weekend in Liverpool. Thank you! I really enjoyed this wine tasting with Helen. She's a wonderful and enthusiastic teacher and I learnt a lot during the wine tasting session. Muizo obrigado! Helen was a fantastic teacher and had brilliant knowledge to share! Great experience! Sarah Rose - Very knowledgable! many thanks! Kate Coundley - A great evening thank you! Robin Thorn - Excellent, instructive and enjoyable! Keith Bugden - Excellent, good fun and informative. Annie Chisholm - I learnt alot!! Thank you, really good! Julie Gallagher - Very relaxed and enjoyable evening. Learnt lots! Thank you so much for a fantastic evening on Tuesday at Hotel Maiyango. I have blogged all about it but not given anything away about Rob’s quizzes, bonus points or amazing tips and hints. I just wanted to provide some feedback on the WSET L3 course I completed this weekend. I was, overall, really pleased with how the course went – the sessions were quite intense, and at times I felt somewhat overloaded with information, but I thought Chris was an excellent tutor, and had a great number of tricks for helping us remember key facts for the exam. I also found the technique he helped us develop for the Systematic Approach to Tasting in particular brought a lot of sense to the whole exercise, and made the exam feel a whole lot less daunting. I just wanted to say big thanks for your great attitude and professional straightforward tuition which helped me to pass the exam with distinction. It was a great course with a happy end. A really enjoyable experience (Piccolino, Liverpool). Greeta - Helen was great! Full of useful info and as expected there was delicious wine! Megan - Thank you for a splendidly informative evening! Krystyna - Really enjoyable and interesting! I learnt a lot of interesting knowledge I will take away with me. Lucy - Fantastic evening really informative and interesting. We enjoyed the day very much thank you and both thought it was a good day. Camilla spoke well and we found her presentation interesting and informative. Many thanks! Really fun, great format, learned that my husband and I have totally diff taste in the cardboard test - explains a lot! Woo! Great to know more - v enthusiastic session. Brilliant. I can’t tell you how pleased I am to have passed the Level 3. My best to Chris. I seriously enjoyed Level 2; Level 3 was a challenge & nearly finished me off, but Chris made it all great fun. Thank you for an entertaining and informative evening I thoroughly enjoyed it. Great time! Very enjoyable. Would definitely recommend! I thought Helen was fantastic, really great evening! Thank you. Anecdotes, history and insight, superb. Warm and entertaining delivery, thank you Helen. Lovely witty evening, Good crowd and excellent tuition. Thanks so much. I just wanted to pass on my thanks for last weekend's wine tasting - we really enjoyed it. Camilla made it really accessible so we felt able to ask questions and her answers we're full and knowledgeable. Thank you for letting me change the date - do glad we made it in the end! Thanks once again for last night's wine tasting at Brasserie Blanc, we had such a great time and Chris was a great host! Fantastic night – we all really enjoyed it and it was actually rather fascinating. What a wonderful field to be so knowledgeable in! I’m disappearing to south America next week for a two month trip but on my return, I think I will definitely be ordering myself some fizz! Thank you for a great night. We had a wonderful time on Saturday with Brian. He pitched it just right. Friendly and low key but very informative. My brother who has attended many wine tasting events spoke very highly of Brian, saying he learned more from him than all the other events he had attended. The event was a Christmas present from my sons and they could not have chosen a better present. Thank you ThirtyFifty and Brian. Attended your wine tasting day at Bosworth Hall and have to say we had an amazing day - Erik was fantastic - imparted great knowledge which has given us the confidence to branch out from our norm and made the day - and weekend - thoroughly enjoyable, will be recommending your company to all our friends, thank you for a professional, educational and brilliant day! I am coming back to you after my WSET Level 1 session last Saturday Feb 22nd. It was very good and very interesting - Camilla is an amazing teacher, she has demonstrated patience and pedagogy with all participants, and a high level of professionalism. Belinda “Very good evening, young lady was very good! Matthew “Lovely evening, great company and presentation"
We attended the Bosworth Hall wine tasting weekend on Saturday. It was absolutely superb!! It was our first and were we a little concerned it would be pretentious and subjective but we learned so much and loved the way it was designed for us for pursue the wines we love, as well as find wines we would never normally consider. All that good stuff said, Eric was the real highlight of the day - his knowledge was amazing (I don't remember a single question he couldn't answer) and his humour and presentation style were perfect from the very early stages to the more challenging, noisier moments later in the afternoon after all that wine! Can't recommend him and the entire day highly enough. Thanks again. I am writing to give feedback following the wine tasting weekend at Bosworth Hall. This is the first time that my husband and I have done a wine tasting and we loved every minute of it! We were lucky enough to have Erik to take us through the event and he is a credit to your company. He combined useful knowledge with humour and made it into an extremely pleasurable day. We will definitely be attending another one in the future. Very enjoyable & informative, better than others I have been to! Really enjoyed the experience. Chris knew his stuff and actually came away feeling like I learnt something. Chris Scott was superb, entertaining and knowledgeable. Makes the novice feel at ease. Well done! This has been so much fun! I didn't want it to end - will definitely be back! Very interesting, great presentation and fun! Fantastic tuition! I have been to a couple of tastings where I have not learnt anything and today I learnt a huge amount. Great knowledge, easy to digest. Thank you. I just wanted to write and say a massive thank you for the wine tasting course we went on Saturday. Myself and Liz (her birthday present) had a lovely time and really learnt a lot. Our tutor was really knowledgeable as well as welcoming and this made it really easy to enjoy and find out more. There was plenty of time for questions and the food was also delicious. I really appreciate it and would definitely recommend it to friends. Really enjoyed the day! Very interesting and have a new found appreciation for wine. Very enjoyable course. Informative, entertaining and fun. Nice light hearted style which made it easy to understand and discuss. The day was indeed 'refreshingly fun' - thank you! The taste test section of the Discovery Day was really interesting and useful. The whole day was informative and enjoyable. Excellent course. Great presentation in a relaxed environment. Chris great fun. Fantastic. Loved all info received. What a great day and the very best host (Chris). Excellent event. So much information which will make wine drinking so much more fun. Very useful! Scientific, unpretentious and fun! Excellent day, good mix of wines and science and food & wine matching advice. Matching food with wine - excellent! Interesting information on your taste preferences and useful info on regions. Great...well structured, food matching was great and very useful. Superb presentation thank you - made wine tasting accessible and fun. I found the overall structure very informative, i.e. how to identify a wine, matching food & wine, taste testing wine glasses very informative and exactly what I wanted. Chris got the tone perfectly right between light hearted and fun and information giving. I loved it! Erik, A huge and massive big thank you to you and ThirtyFifty. We had a great time and your wine expertise was both educational and enjoyable. You did make the experience yet again worthwhile. This has now been our 3rd time and will be coming back next year! Just wanted to say how much I enjoyed the course on Saturday. Learnt a lot and also had a lot of fun. It was a really good social day out - got an all round grounding of how to taste wines! Excellent course. Chris made the course very interesting but fun. Bought for us for our anniversary pressie - really enjoyed it - thanks Chris! Thank you. V. interesting, informative and fun day! Good delivery. Covered all the points of the subject without too much jargon. Well done 9.8 out of 10! Thank you for your email - had a week off to recover and absorb the enormity of reaching 60 years old, lol. I would like to thank you, the company and especially Erik. What a marvellous job he did. Everybody found the day of Wine Tasting, very informative and enjoyable. It was interesting, educational and lots of Fun. We loved the competitive edge, and Erik kept our attention and interest all day. It was everything and more, that I had hoped for. Thank you, we had a lovely evening, really enjoyed and will be booking another one in future. Highly recommended and our host Robert was lovely. Please pass on my thanks. Many thanks for transfering our wine tasting vouchers to Bosworth Hall. Erik was a very entertaining and knowledgable chap and everyone had a great time. The venue itself was buzzing with a wedding but the staff coped very well and your event was enhanced even more by the stunning stately room that it was held in. We thought that being part of a team made everyone feel welcome and involved and we have made some new friends with similar likes that we are keeping in touch with. We were all fascinated by the variety of wines and bubbles that we were able to taste. 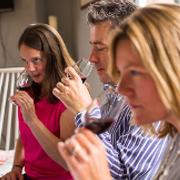 We will be recommending your tastings to friends and relatives and hope to attend ourselves again one day. Keep up the good work! Hi Jane - just back from a very enjoyable day at Piccolino. Please pass on my thanks to Robert for a very full and informative day. I learnt a lot as well as enjoying sampling some different and unusual wines. The venue was excellent and it was great to have lunch outside in the sunshine before heading back for a hard afternoon's tasting! Camilla, thanks for a really good day on Saturday I learn a lot and enjoyed every moment. Thanks again. Hi Camilla, I just wanted to say that I had a really good time with you and the group last week. I will definitely be recommending the tasting day and your company to my friends. Thanks again! I would just like to say what a great day me and Alana had on Saturday. Chris was most entertaining but at the same time educational (without being boring).We will definitely recommend you guys to our friends. Thank you for a great evening, really interesting. Chris was a great presenter, deliver fun and interesting. Had a fabulous day thank you - learned lots and enjoyed myself. I had a wonderful day, everything from the company, the food, location etc... I've already highly recommended the course. Thank you Robert for your wonderful knowledge also. A huge thank you for the wine tasting course that my husband and friend attended on 8th Oct in Bristol - they haven't stopped talking about it and had a fantastic day! An excellent day. Was a truly fascinating insight into the wine world. Very well presented, thank you. A fantastic group of people, good fun all around. Definitely made me think about the types of wines I drink, Excellent day! Very good course. Lecturer knew what he was talking about and was entertaining. Thanks very much for a super day. Very enjoyable and learn't something too. Excellent course, Excellent food. Erik, I just want to thank you very much for a most enjoyable day at Nidd Hall hotel. You put a lot of work into it and made it so interesting and fun. Maidie and I learned a great deal from you and we appreciate all you efforts and preparation. I hope we will get a chance to do something similar again. Just to let you know we had a fantastic time on Saturday, and learned loads - well worth the wait. Toni was superb, the venue excellent and we met lovely like minded people, wine lovers! I hope Edinburgh takes off, as we will definitely be recommending your wine tasting day to friends. Lovely day! Lots of information, great variety of wine and good food too! Will happily recommend. Excellent delivery. Very informative. Great day and would recommend to others. Very enjoyable day and we learned some things too! Great, thank you. Very informative, a nice selection of reasonably priced wines. Thank you! Very enjoyable evening, thank you! Really enjoyed the training course, very interesting. Extremely informative. Chris was a good facilitator and very knowledgeable. Interesting day and I'm walking away with a lot more knowledge about wines. Fantastic day. Just the right level of humour and information. Thought Chris's relaxed style was excellent. Not wine snobby thoroughly enjoyed the day and would recommend to friends. Great day, both informative and entertaining. A very enjoyable event. Excellent value, informative as well as fun. A really fun day, informative but presented in an accessible way. Very enjoyable day. Not my first wine tasting course, but I learn't some new things! Very interesting course, well presented with plenty of interaction. Brilliant day, great fun. Chris was a great entertainer. Great day with a good variety of wines. Will definitely be recommending this course. Presentation was excellent - worth a second visit. Great way to spend a Saturday!!! Very enjoyable and informative. Thanks. Very enjoyable day, well presented, informative and interesting. Great course, great trainer. Thanks. Very Good. Will definitely do another one. Very enjoyable and informative day. Great presentation. Very enjoyable and very informative. Will definitely be tasting my wines in a different way from now on. Would recommend this tasting day to friends and family. Thank you. Very informative. Excellent thank you! Excellent very professional, fun and informative will recommend to friends and family and return for one of the other food and wine tasting events. Thank you. Excellent host - makes you think - perhaps drink slower ! Many thanks for this - much appreciated. I've had a quick glance at your website which looks great. It was very good to meet with you on Saturday and to have the opportunity to taste such a wide-range of different wines in a short period of time. I very much enjoyed your presentations - a good mix of humour with information. Thank you for making it a very enjoyable day. Enjoyable day. Chris made it all enjoyable and easy to understand. Thanks Chris, had a great day really liked you style, informal fun and informative. Well done mate. I have had a really pleasant and informative day. The food was lovely and the wines were extremely good. My understanding of wines has been expanded, and I would like to have the opportunity to attend a more intensive course. Very informative. Chris made our wine course great fun and has encourages us to experiment more with our wine tasting and buying. Good variety of wines to taste and invoked a lot of discussion. Great day. Really enjoy the presentation. Good mix of solid information and fun anecdotes. Good mix of wine. Very enjoyable information and entertaining. Chris works very hard to hold every bodies attention. First Rate! Also tasted some wonderful wines of which I will be tracking down one or two at some point. Brilliant day, very informative, good range of wines and interesting new variants. We will definitely recommend 3050 events to friends. Brilliant - very lively, much fun - well done! I feel more confident than ever after this course. I have learnt about flavours, I've always thought I'd stay away from sweet wines, but actually they're very satisfying. Chris Scott was excellent!! Thanks! I would just like to say thank you for a very well run event, myself and my wife enjoyed the evening very much. It was very interactive and the information was delivered at just the right level. Very impressed, enjoyed the course. Thank you. My wife and I were on your One Day Wine Course on Saturday, a Christmas present from our son, and we want to thank you for a brilliant day. Your presentation was excellent, very informative and great fun. We learnt a lot and we'll now enjoy our wine all the more. Thank you very much. We will be recommending ThirtyFifty to all our friends. Wasn't sure what to expect.... but a fantastic day. Really really enjoyed it and would recommend it. Really good presentation. Chris made the day fun. Thank you both, great hosts - really made it interesting. Fantastic day, Christopher was very informative and interesting. Really interesting and engaging, Thank you. Just wanted to say a massive thanks for the course on Saturday. It was great fun, and you managed to find a perfect balance by making it informative but relaxed at the same time. I will definitely be spreading the word about ThirtyFifty! Just to say thanks for a very enjoyable day last Saturday. It was great to spend a day enjoying interesting wines with like minded people and with good tuition.